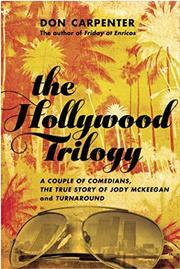 A re-issue of three Hollywood novels by a West Coast author and screenwriter who died in 1995, following the recent publication of his last novel, Fridays at Enrico’s (2014). Meet the comedy team of Jim and David. A Couple of Comedians (1979) is a raunchy, high-spirited ramble from David’s Northern California ranch to Hollywood, where they make one movie a year followed by a stint at a Vegas nightclub. Yes, they’re famous; they’re also free spirits, chasing chicks and scoring dope. David is the narrator, and his view of Hollywood is nuanced, for among “Hollywood’s collection of contemptibles” is one of the original moguls who, combining self-interest and magnanimity, gave them their winning big-screen formula. David skips the moviemaking—it’s boring—but we feel a frisson before their nightclub act. Jim may be having a breakdown: Will he show? Less quirky is The True Life Story of Jody McKeegan (1975). Jody has had a hard life. In her hometown of Portland, Oregon, she watched her big sister die after a back-alley abortion. Failing to find acting work in New York, she became “a thief, a pimp, a blackmailer, a junkie.” In Hollywood, however, close to washed up at 35, she catches a break. She meets the producer Harry Lexington; they fall in love. Jody’s perfect for a role in his current movie. Overcoming his scruples about casting girlfriends, Harry gets her the part. But will self-destructive Jody keep it together? The suspense goes down to the wire. Turnaround (1981) has less edge and energy than the other novels. None of the three principals (two studio executives and an aspiring screenwriter) has the vital spark of Jody or those hell-raising comedians. The real story, the painful coming-of-age of a screenwriter, something close to Carpenter’s heart, arrives too late to grab us. Two of these insider’s novels, at least, give fresh impetus to the Carpenter revival.